Wow, how has these last twelve months flown so quickly, when the year before d-r-a-g-g-e-d by so slowly? It’s amazing what a little job security will do for the time clock factor. Over the last year, I have processed our time of unemployment. I have processed it financially, emotionally, spiritually, and dissected it in all around life lesson areas. I don’t want to forget the lessons learned. I want them seared in my memory, but like any experience, the further out we get from the time period, our memory begins to fade. So I am going to spend a little time reminiscing, in hopes that I will continue to grow from those lessons learned, and in turn, encourage some of you as well. I am going to bring the elephant to the middle of the room. I would not trade the difficult financial life lessons we have experienced over the last decade for anything, but the bottom line is: Life is easier with Money. It’s as simple as that. While I continually share ways to live on less and love it, having more and then choosing to live on less is the best of both worlds. Most of the ideas on this blog revolve around ways to save money, but do not misunderstand one of our end goals: to build “wealth” in both the immediate, financial sense and eternal “wealth”. The word wealth creates a multitude of feelings and emotions and honestly, for me to type right here that I want to build wealth feels very uncomfortable. I do not need money to be happy. In fact, as our family saves money, my spending habits have not changed. I could have a million dollars in the bank, and I would still shop at Goodwill because that is who I am. My core is built around living a frugal lifestyle, and I love being a good steward of what we’ve been given. In building wealth, our end goal is to have zero debt, which means we are striving to have our mortgage paid in full as soon as we can. We are working towards having a fully funded retirement account, to pay HALF our children’s college educations in cash, again, no debt, (they will pay the other half) and during this entire time have enough to give generously, and share with people who are in need like others did for us. Money is NOT the root of all evil, as commonly misquoted. It’s the LOVE of money that is the root of all evil, so wrapping our brains around how to have money, without placing it as an idol in our lives is one of our priorities. For a year, I lived with a tummy ache whenever I had to spend money. Now, that extreme stress has passed, and I admit, I don’t miss it, but I remember. I remember what it’s like as if it were yesterday, and I do not want to forget or miss out on the gratitude that I continually experience resulting from my husband’s employment. The majority of wisdom and character growth that I have experienced in my life has come as a result of great pain. I have so far to go on this journey and I admit, I don’t want to have my “iron sharpened” any more.I am tired of “growing” through pain. Can I be honest and say that? I would love to continue learning amidst ease and comfort, but I also wouldn’t trade my experiences for anything. The authority I hold now as a “frugal living expert” has come through experience, painful experiences. I have lived it, learned from it, and I now want to share and encourage others that financial freedom is possible in the midst of great difficulty. Now, please don’t think I am a martyr. Like I said before, life is much easier with money, but for those who have never experienced any sense of real financial difficulty, it’s hard to ever understand this sense of complete need. Even for those of us going through extreme financial hardship in America are still so much better off than the majority of those in other countries. We are a blessed, blessed nation. When I climbed a volcanic mountain in South America, the view once I reached the top was unimaginable. The breathtaking beauty overwhelmed me, and yet so much of that appreciation came from the difficult trek up the mountain. If you are in the middle of financial difficulties, I feel your pain. Those are not just trite words. I was just there. It does pass, but that doesn’t mean the journey isn’t one you wish would be over with…now. Please don’t waste the pain, but don’t let it over take who you are either. For me, my relationship with the Lord was my strength. I know He is the same yesterday, today, and forever and none of this has taken Him by surprise. I allowed the time to strengthen us, to strengthen our family, to dig into gratitude and look daily for those blessings that before, we took for granted. Now, trust me, that was hit or miss as well. Some days were just down right bad, but in the end, we didn’t waste the pain. If you missed our journey, here is just a portion of what I shared during that time. Read bout Our First Big Cash Purchase AFTER unemployment: the Porch that took 17 years to build. Our family, also, walked the unemployment road last year. My husband has been employed for eight months, but employment meant relocation and we have only lived together/ in the town where his job is for about 6 weeks now. Still feeling quite in upheaval and adjusting to the new town and different financial stress (new mortgage, different cost of living, etc.). Thank you for sharing this — it is so good to stop and look back and be reminded of God’s faithfulness. Yes, I had to be a good steward of what we had, but God always provided what we needed. I’m not ready to fully look back, yet… but I believe that I am called to do that so that I can tell of His faithfulness. Thanks for sharing, Sarah. Moving to a new location is such a huge life change in and of itself. I’ll be praying for your adjustment. We are still on that unemployment journey. I don’t mind being frugal at all but the most difficult thing for me is having medical/dental needs that can’t be met. It really makes you feel vulnerable and can be quite frightening. It has really taught me what resting in the LORD really looks like. Not just lip service, but actually putting faith into practice. I look forward to the day when we have employment and insurance again. I am glad that your husband is employed again and things are more secure for you all. Thanks for sharing your heart and your lessons learned. 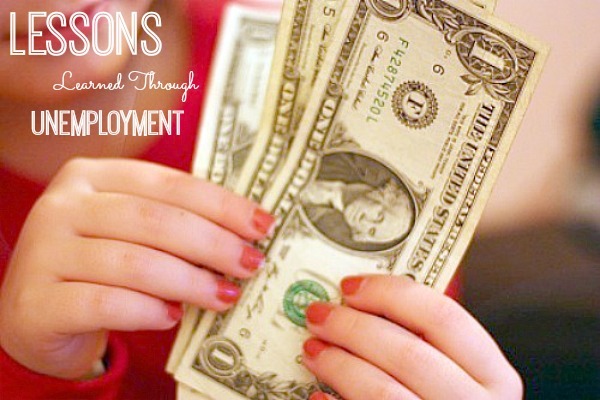 My husband was unemployed for 18 months and it was difficult, but looking back, we also treasure the experience. We had never before had to lean on God to meet our needs and we were blown away by how every bill was paid on time, while still tithing. I realized we “needed” far less than we thought we did and just staying out of stores was key to keeping things under control. In the old days I would go to Target or Kohl’s just for something to do and invariably always ended up finding something I “needed.” But when my husband was without work I only went when there was a real need for something — which was very rare. The hardest thing was not being able to DO anything extra. Other people always complain about not having enough money, but friends & family didn’t fully understand that when we said we didn’t have enough money, we really meant it! If it wasn’t free, we didn’t do it. One big thing that really helped was that before my husband lost his job we felt led to take a Dave Ramsey course. We were already debt free except for our house and were looking at our next step. We started putting together an emergency fund which was something we had kind of pooh-poohed in the past. We were so glad we followed God’s nudging. It was a huge blessing!! This is a great post especially during this economic climate. Thanks for offering words of hope. For the most part, I buy necessities. I remember when I was a child my mom sewed our clothing to save money. Unfortunately, making clothing today doesn’t offer the same savings. We only have one fabric store in our area and the savings are few and far between. About paying for our children’s college…I don’t remember what financial guru said this but he/she said that our children should pay for their education. The reason being that parents should not take away from their retirement funds and that the children will have, if they are blessed, a good 40+ years to payoff school debt. Depending on the age of the parents, paying for some or all of their children’s college expenses would make a huge dent in their retirement funds. Just a thought. Thanks for all your shared! My husband was unemployed for three years, and during this time we lost everything–our home along with $200,000 in cash equity and all our savings. (This was California, people!) This was after we helped put our four children through college, and I came through breast cancer and all the expenses of that. We have faithfully and generously tithed all our married life. Whew! But God was and is faithful and provided all our needs and some of our wants. My dear hubby is now employed in a job that he loves. We downsized from a 2,800 square foot home to an 850 square foot townhouse, moving cross country with everything we brought in one POD, and we LOVE it! We are as snug as a bug in a rug in our little place. And God provided this for us in a most miraculous way! What did I learn from this? Mostly that God is God! He will do what He wants, when He wants. He is the Creator of all, and we cannot question what He does in our lives, however painful it is. We don’t have the full picture, and may not know many things until we stand face-to-face. If we are commited to Him, everything that happens in our lives is what He wills. We really only see the physical. God is more interested in our becoming more Christ-like as we sojourn on this earth. His goals are for our spiritual well-being. Besides, we are not to be surprised at the “fiery ordeals that come upon us to try us,” although we certainly do strive and object when they come! All of you who are facing this, I hope you will not lose heart. I speak as one who lost it all and was humbled in more ways than you know. But God walked before and with us, keeping us healthy, providing food and a roof over our heads. We marveled at the love, generosity and support of our grown children. He brought me to the place that He wanted me to be–completely and uttterly dependent on and resting in Him. @Isabella, Wow! What an awesome testimony! Such good lessons and reminders. I love that you pointed out that the love of money is the root of all evil. It is misquoted most of the time and it just irritates me! Of course there are those who have much and hoard even more, but there are so many that have so many blessings and they share those blessings with others and it is clear that they don’t let money rule their lives. It is what you make of it!! Thanks so much for your honesty – you put into words what I was reflecting on this week, that it is okay to say “Yes, life is easier with money.” With my husband being self employed, his income tends to turn on and off throughout the year. While it is challenging in the unemployed times, it is amazing to watch how God is faithful and how he meets our needs (and even our wants sometimes!) In those seasons, I am always overwhelmed by His goodness. I was unemployed for a year when the economy tanked and while it was nice to have the EDD checks, it was very stressful looking for work and worrying about paying my bills. I totally understand and agree with you. Thanks for sharing this update on your feelings, Jen. I agree that the best of both worlds is to have money and still choose to live wisely and frugally. We haven’t been in the place in the last 2-3 years and I miss it. Most of all, I miss not being able to give in the way or to the degree I’d like. Just this year, we will have gotten both kids through college in the same financial style you plan. It has been quite a learning experience for all of us. They are both really smart but with different personalities. One is a saver, the other a spender. Both had some scholarships and could have had more with effort. We matched their money saved and spent on college. Both are launching with pride in their own personal accomplishments and no school debt. I agree that having money and still choosing to live frugally in order to accomplish goals and help others is the best of both worlds. That having been said, apparently you knew that when your husband went back to work, he had the ability to produce a good income. So many do not have the education, or even live in an area, were good salaries will ever be an option for them. These ones must struggle day to day with minimum wage incomes. There are many for whom very low income is a constant reality. It can be very depressing to hear one who has only gone through temporary hard times, to speak of how nice it is to finally be secure, and speak of themselves as “fugal living experts”. They know what being an expert with very modest means is, and for most, there is so pat on the back if they are succeeding at housing and feeding a family every day, every year, on tiny incomes. I appreciate you sharing your views, and I am very sensitive to people going through those circumstances. While I completely understand your perspective, and yes, we do now have a good living, you don’t know any of our financial history, since obviously, I don’t share all details on every blog post. Over the course of the last decade, we have gone over three years without any income, putting us well within the range and average of the people you are speaking of during those years, with seven in our family. Even though we are far from that now, and do have the ability to produce a great income, I in no way pat myself on the pat as being a frugal living expert for only going one year unemployed. It’s all the times you don’t read about. That title came from years and years, growing up in some extreme financial difficulties as well as working our tail off day in and day out to be creative in bringing in additional resources. While my heart goes out to Americans living in poverty, and it is a cycle I wish we could break, I also know this is a country where we are still so blessed to even have the opportunity to have housing and food. Our family is blessed…beyond blessed, in no way do I deny that, but it’s also the land of opportunity, and my desire is to encourage women and model ways to save even more money on whatever income that is…whether it’s 20K/year for a family of five or 200K. And not just save, but to develop a spirit of entrepreneurship and begin finding streams of income aside from a 9 to 5 job. I’ll be speaking to that later, but it’s possible to increase income, even if it’s just to help a little more with groceries…for anyone who has the desire, motivation and stick to it attitude. Yes I know that in the middle of it, and the ongoing journey, I know it seems impossible. So my apologies if frugal living expert comes across wrong, and others have coined that for me, yet now I claim it. Someone can be an expert at living frugally, even with a good income. I believe the misunderstanding is in the fact that frugal living is a state of mind and really has nothing at all to do with how much or how little income you have. In my opinion it is about choosing to live in a way that you are consciously choosing not to be wasteful or live with excess. I started a site to help people live on less, but live better. Reiterating to people the need to live under your means is something I find hard to convince them of. People don’t think it’s necessary if the here-and-now is all roses. I loved your line…. “Like I said before, life is much easier with money, but for those who have never experienced any sense of real financial difficulty, it’s hard to ever understand this sense of complete need.” I still struggle with remembering those difficulties because when money returns, I find myself spending a lil more here and there. But, I have to remember that “sense of complete need” for my good! Thanks for your open honesty and for making Christ your focus. Such an encouragement! God Bless! @Leah H, You said you started a site to help people live on less. Could you give the link for that? Sure, it is very basic and just getting started, but please take a look and share. I need much more content, but I add as I can 🙂 I am trying to focus on buying better and eating better, but for less. Thank you for this post. I am one of those going through this now and I NEVER thought this would happen to us. I was the one who lost my job- a good-paying job bringing in half of our income and now watching my husband work double, is a painful thing to watch. BUT I stay positive, do what I can to live on less, and use my freer time to spend taking care of my family in a way I never had before because I never had time. I too know that my God will never leave us or forsake us. We love Him, serve Him, honor Him in all areas of our life. He has us for sure. We are humbled and obedient and waiting on Him. God is speaking to me clearly during this time. Waiting is hard, but I totally trust God’s ways and His timing. And I know we too will look back on these times as stronger and better than before. God is good and His Word is true. Please pray for our family during this time. You know how some days can seem more stressful than others. Thank you for your encouragement. Looking forward to a glorious future! I will definitely be praying for your family. Even though we are a few years removed, I feel as if I can close my eyes and am right back in the middle of those emotions. It’s such a trying time and emotionally exhausting, but I know how much the Lord met me during those times and I will pray the same for you. Today of all days I ran across your story. My husband lost his job today. We had gone down this road before so you’d think we can handle the news, but there’s no stopping the tears or the fears of what’s going to come. In 2009 in a matter of less than 24 hours, we both lost our jobs & our dream of adopting a baby was put on hold. My husband was able to find something in 2 months at less than half his previous salary. I did odd jobs until I was able to get 2 part time jobs in 2010 at a 1/3 of my previous salary and my husband found a better paying job. I did extreme couponing. We never went out much before we lost our jobs. We definitely didn’t go out any after. We just held potluck dinners with friends. We slowly rebuild with the help of in laws. In 2012 we were able to gather enough money for the adoption fees and were blessed with a sweet baby boy. Just last fall I finally found the job that I love with a decent pay and was beginning to feel we could start saving for retirement & even a long weekend vacation this year. To be dealt with this blow today, I’m devastated. Now with a 2 year old, I’m scared. How do we provide for him. How do we pay the bills. My faith got me through the first time. Will it see me through again. Jen, I was thrilled to read your text. Recently my family and I have been through many financial difficulties, but ultimately, the victory came, and I felt comforted and warmed, because I never walked away from God or my faith, and indeed the difficulty is that the forge, and make us better more prepared for the difficulties both as to the facilities. Thank you. SO, so true, Rita! It’s a journey I don’t wish on anyone, but so grateful for the lessons learned.